Then, click the "Show History Chart" button on the right side of the page. 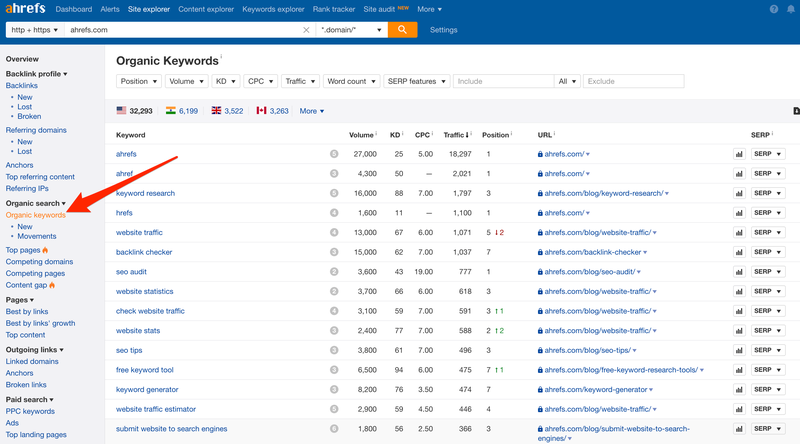 For each particular keyword, you can see which position your website ranked for on Google's SERPs and how it changed. To see the graph only within top 10, 20, 50 or 100 of search positions, switch between corresponding modes in the top right corner. Under the graph, you can see the list of all your website’s pages which rank for this particular keyword. Check/uncheck some of them in order to add/remove their curves from the graph. Another cool feature is the ‘Add Domain to Compare’ button. Insert your competitor's domain there to see which of their pages rank for this same keyword and where they are placed on the graph. On top of this, ranking history can be found in our Rank Tracker. There you can track position history of any keyword from the day you’ve added it to the dashboard. Lite: See positions history in the top 20 results and up to past 6 months. Advanced: See positions history in the top 100 results as well as the full history dating back to June 2015. .
Agency: See positions history in the top 100 results as well as the full history dating back to June 2015.